The Small Press Project is a collaboration between students and staff at the Slade School of Fine Art, UCL and UCL Library Services. Now in its fourth year, the SPP uses the Small Press Collections (a public collection held in UCL Library Services’ Special Collections) as a unique historical framework within which we can scrutinise contemporary art practices. 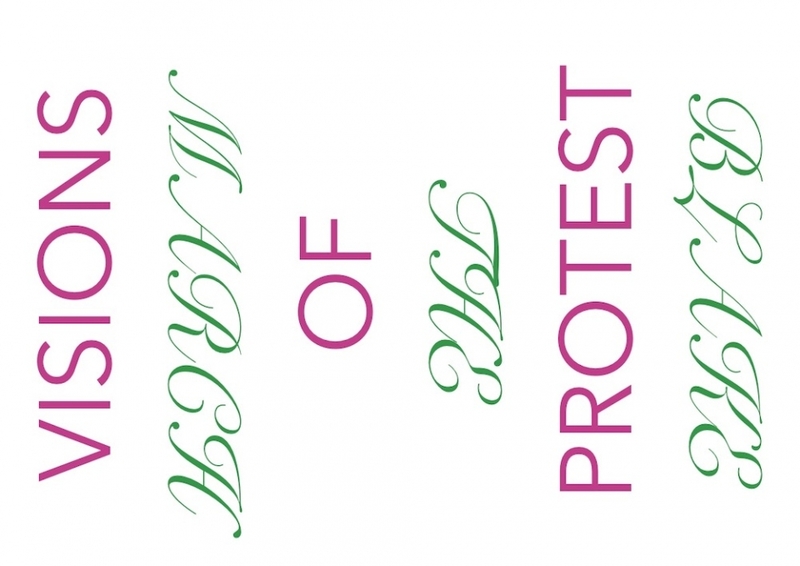 This year’s theme, Visions of Protest: BLAKE THE MARCH, has been used as a critical lens through which we can focus on what connections exist between the democracy of print, their aesthetics and the autonomy of artists’ books and publishing. The project is formed through a programme of workshops, performances, screenings, talks, collaborations and interdisciplinary practices involving non-academic institutions and the public. Visions of Protest: BLAKE THE MARCH is an ambitious and multifaceted project of optimism in adversity, of action, of challenge to hierarchy, of learning from the past to inform the future, of solidarity and resolve, and of using creativity to ignite change. It proposes an alternative space of enquiry to the social and political boundaries of gallery culture by exploring a shared and democratic approach to art making; one that addresses embedded inequalities and provides a forum to examine contemporary Small Press Publications in relation to their historical context, and to explore the medium as an autonomous art form; a way to disseminate, promote, share and distribute artwork; and as a container of ideas. Award, UCL, IAS, Slade School of Fine Art and UCL Special Collections. Join us in banner-making through various print processes to include cyanotype, screen printing and hand cut stencils; collaborate in the production of a live risograph publication with Reading Room; construct a Visions of Protest poem with Sharon Morris; deface currency and passports with David Blackmore. 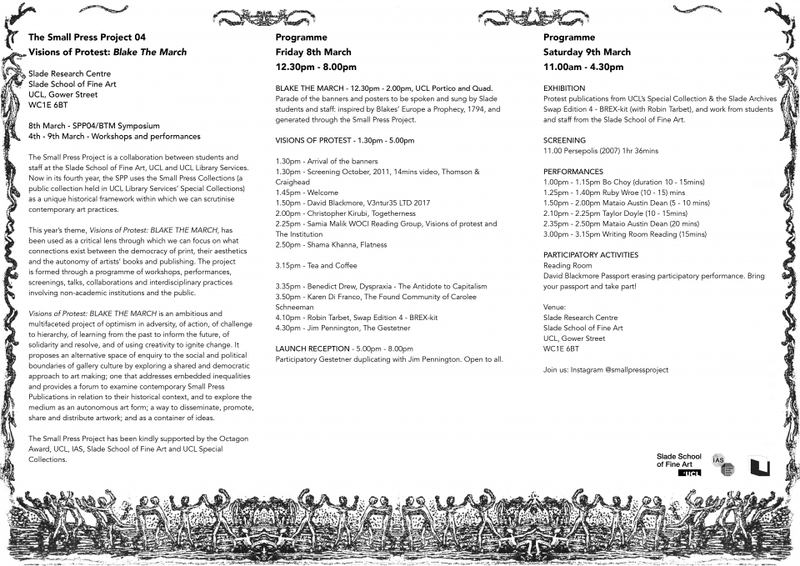 Also included is a programme of film screenings. Parade of the banners and posters to be spoken and sung by Slade students and staff: inspired by Blakes’ Europe a Prophecy, 1794, and generated through the Small Press Project. Participatory Gestetner duplicating with Jim Pennington. Open to all. Swap Edition 4 - BREX-kit (with Robin Tarbet), and work from students and staff from the Slade School of Fine Art. David Blackmore Passport erasing participatory performance. Bring your passport and take part!